Soooo....would someone who got all judgy about the first season's treatment of gender based violence feel more comfortable with this season? Hey, the gang is back together! I was excited to meet a new member of the Bletchley team. I liked Alice a lot. Personally, I liked Season 2 better than Season 1. I know some people said the plot was weaker, but I found the S1 plot pretty weak, and liked the two stories covered in S2 somewhat better. latkes, I don't remember any sexual violence in the first 3 episodes of Season 2. It's certainly much less of a 'thing' than it was in S1. I haven't actually watched the final episode yet, there may be some sexual violence there. I just rewatched it. 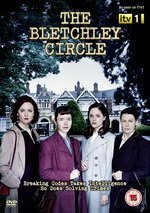 The difference for me, from season 1, is that this mystery is less of a timetable, cross-checking mathematical conundrum that drew on their Bletchley codebreaking talents and more like an ordinary murder mystery with the Anna Maxwell Martin character making huge intuitive leaps, oh she's her daughter, by the murdered guy, being chased by the Army. Maybe there is more investigative work in the 2nd part, I forget, but what I liked about the first one was the labyrinthian plot with several false starts. This one seems much more straight forward. Those are good points, TWinbrook8.